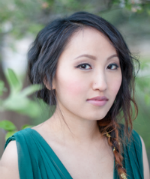 Today I’m happy to bring you an interview with my critique partner Lori M. Lee. Thanks for stopping by today, Lori! For the uninitiated, could you give us a brief overview of your writing journey up until now? Thanks for having me, Lauren 🙂 It’s been almost four years since I began my first manuscript-with-intent-to-query/publish in 2009. It was a NaNoWriMo, and I spent a year editing and rewriting it based on feedback from my amazing CPs (like you! :D) before querying. While querying that project, I began working on Gates of Thread and Stone. This story so much fun to write, and I was extremely fortunate to receive an offer of representation in November of 2011 after only a few weeks of querying. But the work definitely didn’t end there. A major revision and a year later, I finally got that yes from an editor! What is something that surprised you about being an agented writer? Many aspiring writers put so much emphasis on getting an agent without necessarily thinking about what happens after reaching that milestone. This is sort of dumb (and a good example of how my brain works… or doesn’t, in this case), but when I began my next project, I had brief moments of panic when I thought about writing the query. Then, at some point, it struck me—I don’t have to write a query. My agent doesn’t require one. The query was always such a stress-filled requisite of writing a new manuscript-with-intent-to-find-an-agent that it didn’t immediately occur to me I didn’t need one b/c I already had an agent. And believe me, when that realization hit, it felt AWESOME. I’ve gotten the impression from other writers in the blogosphere that being on submission is kind of like Fight Club. The first rule of Fight Club is: You do not talk about Fight Club. What can you say about your time on submission and how you coped for other writers going through the same process? Being on submission had even greater ups and downs than querying. When an editor loved the book, but it got shot down in acquisitions, that hurt a million times more than an agent rejection because I was so, so close. Being on sub was exciting and terrifying, but also emotionally draining. I coped with everything first by working on something new and then inadvertently by getting pregnant lol. With my mind focused on a new world and new characters (and the impending baby), I had less time to worry about what was happening with the book on submission. The Gates of Thread and Stone will be published by Skyscape (Amazon Children’s Publishing) in 2014, and it is the first book in a series. Tell us about the book. Going with what was revealed in the deal announcement (since I don’t know how much more I can talk about yet), Gates is about a girl who stays carefully under the radar to keep her ability—to manipulate the threads of time—a secret. But when her brother disappears, she has to risk getting caught up in a revolution in order to save him. This particularly book came really easily to me, which is not typical. The world building was probably the biggest challenge because world building, in itself, is fairly intricate, but the plot and the characters were very clear in my mind. What excites you most about this next stage of your career? Reader feedback. Good or bad, I can’t wait to hear what readers think. It’s definitely scary, and I’ll probably fumble through it all, but I’m looking forward to it. Finally, what is the single best piece of writing advice you’ve received? Work on your next book while you’re waiting for query responses. Write while you’re on submission. Write while you’re waiting for feedback from CPs or your agent or your editor. Having that shiny new idea to focus on really does make the waiting more bearable, and the bonus is if that ms doesn’t work out, you’ve got your next one ready to go. Be sure you check out her blog (http://lorimlee.blogspot.com/) and follow her on twitter (@lorimlee). Lori’s always been an incredibly supportive writer, and I’m so happy she’ll be able to share her stories with the world! Congratulations, Lori! Your book's premise sounds fascinating. Thanks for sharing your insight and tips!